How we treat your back pain. How to treat your back problems that are causing your pains. I get these 2 questions all the time: "How do you treat the spine, and why do patients get better with your treatment when all other treatments they tried have failed?" The video below has a great explanation of how we do what we do. Click to watch it! 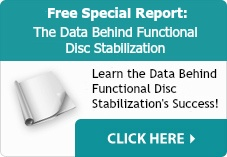 The Key to our treatment is we get healing in the disc. The outer protion of the disc can break down, this breakdown process can cause you severe pains. The source of almost all your back pain that is not going away is the result of this break down in the Disc. Our treatment is very effective for all of these back problems, including complicated back problems, because we get healing of the disc. This is the main reason our treament is so effective when other treatments have failed is because no other treatment heals the disc. This image shows a MRI of a patient before our treatment. The RED arrows demonstrate damage to the discs. The second image with the GREEN arrows shows elimination of the damaged disc. When you eliminate the damage in the disc the pain goes away. We have helped over 15,000 people with this treatment. Dan Hampton is not in the Hall of Fame because he took it easy. He gave it everything he had, and his spine paid the price. He was comtemplating surgery until he found us. If you have back pain and want to get better and live pain free call now to schedule a FREE consultation. We are here to help you live pain free.